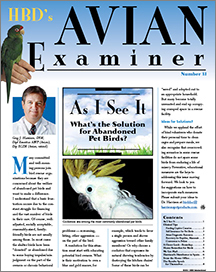 What is the solution for abaondoned pet birds? Feeding captive canaries. Harrison’s Home Remedies, updated for 2011. Don’t fall for “Greenwashing”. Use of Harrison’s in domestic chickens and other species. Benefits of cayenne pepper. Harrison’s Home Delivery. Food, Inc..
Fight global warming, eat grass-fed beef. Organic nutrition for racing pigeons. Benefits of Montromorillonite clay. Harrison’s Bird Bread. Dr. Irene Pepperberg Smithsonian program. Protocol for relating to parrots in the exam room. Use of plants to reduce levels of indoor pollution. Understanding the USDA organic seal. Making a real distinction in the avian examination. Provision of ultraviolet light for captive grey parrots: Michael Stanford. All about the extrusion process. Extrusion vs. other processes. David Vetter honored, etc.